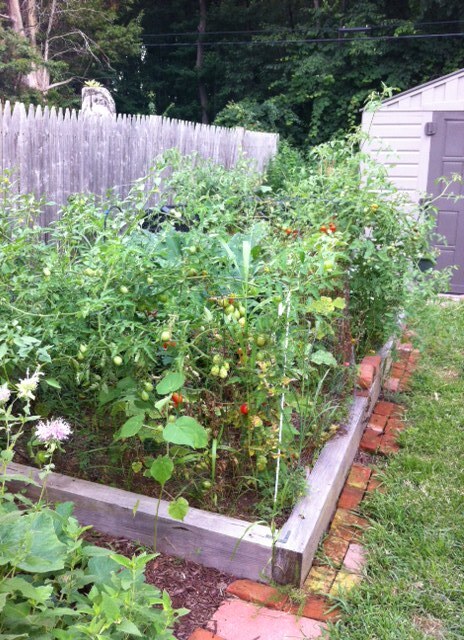 My July Garden 2013 – Writer. Editor. Storyteller. The garlic isn’t from my garden, I just like to keep it close by. We should come up with a name for the time of year when gardeners are completely overwhelmed with tomatoes and zucchini… you know, other than “July.” I also had some blueberries this month (thanks to a bush I bought with tons of berries already on it). I can hardly get to some of the plants in the raised beds. The zucchinis look like man-eating plants, even though I haven’t gotten a single yellow squash. 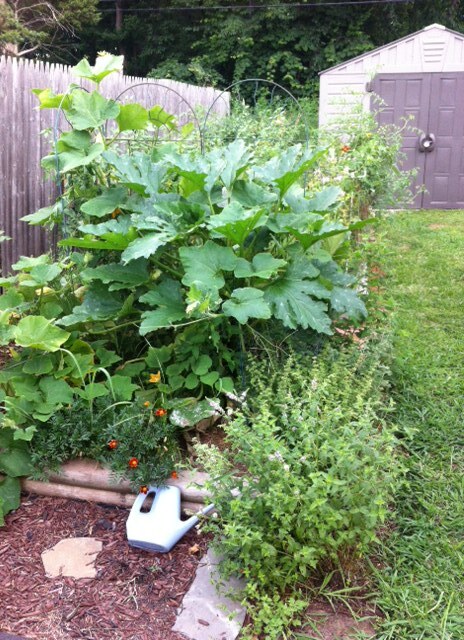 The yellow squash were pretty spare last year as well. Anyone have any ideas on what I’m doing wrong? The plants look fine. Cucumbers, peppers, and herbs are coming in as well. It’s a colorful harvest. The flowers are all in full bloom, and there is no evidence of colony collapse around my house. The bees are plentiful and come in many varieties. The butternut squash vines are huge and though one of the squash succumbed to blossom end rot, there are more coming and I’m keeping a close eye. That squash plant could easily swallow you whole. It’s already managed to “disappear” a tomato. You can’t tell, but there’s a lot of food in there, including tomatillos. 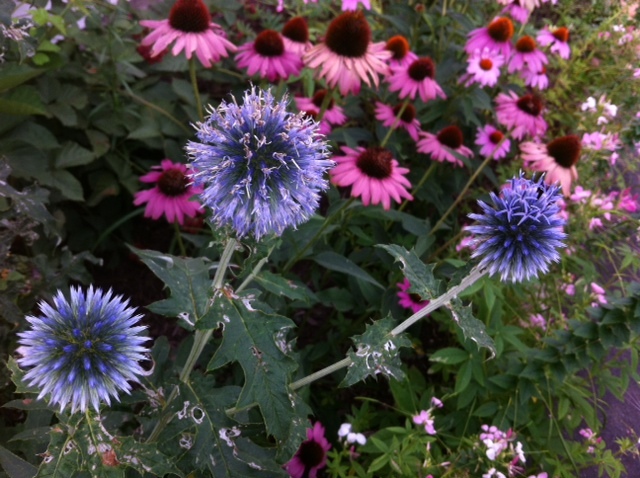 The globe thistle isn’t as impressive as I’d hoped. I’ll move it out to The Pale in the fall.